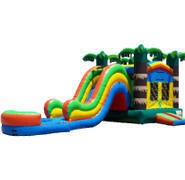 We have a huge selection of water bounce and slide combos available! 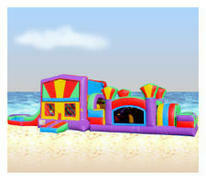 We deliver to your location and set up on time for your next event - imagine a water park in your backyard! 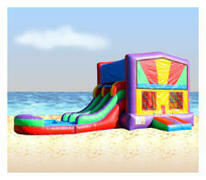 Our water combo bouncer rentals can be enjoyed by any child over the age of 3-years old. 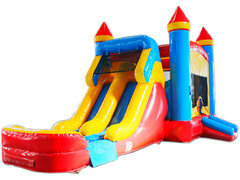 Our combination bounce and slide units are safe, commercial grade, and constructed to meet rental industry standards. 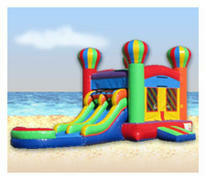 All of our combos and inflatables are cleaned with every use. Did you know that the tallest, fastest, single-person waterslide in the world is 120 feet tall and is located right here in Florida? 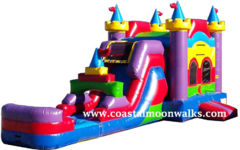 Did you know that currently, Coastal Moonwalks offer's the largest backyard water slide rental in Jacksonville Florida. 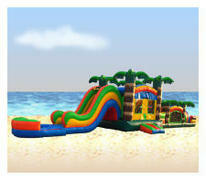 It is a fast dual-lane water slide, measuring 27-feet tall and 64-feet long. 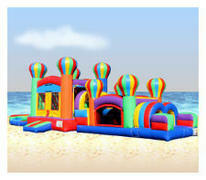 We deliver to Jacksonville, the Beaches, St Augustine, and Northeast Florida. Delivery of is FREE within 10 miles of the Avenues area.